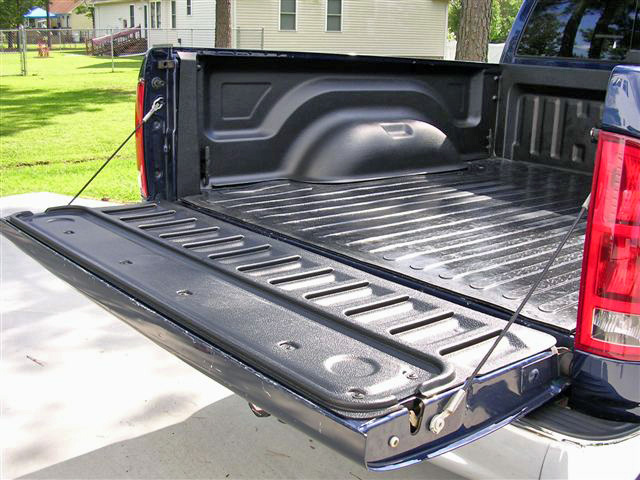 If you’re a truck owner, you know the importance and value of the bed of that truck. You can haul just about anything from Grandma’s rocking chair to a load of gravel. The only problem is that after a few months of use, the bed floor and sides will start to show their age much faster than the rest of the truck. 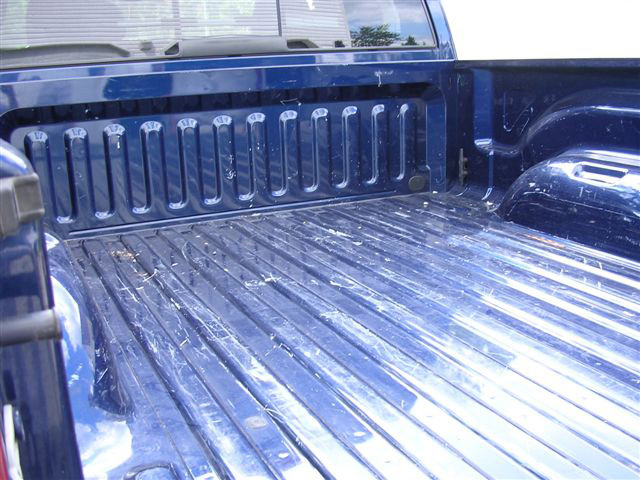 Scratches, dings, and dents will eventually appear... making the truck look older than it really is – and more importantly – will decrease the value of the truck. One of our members at www.HemiTruckClub.com had that very problem... a beautiful truck – until you dropped the tail gate. The bed was scratched up pretty bad and it really took away the good looks of the truck. 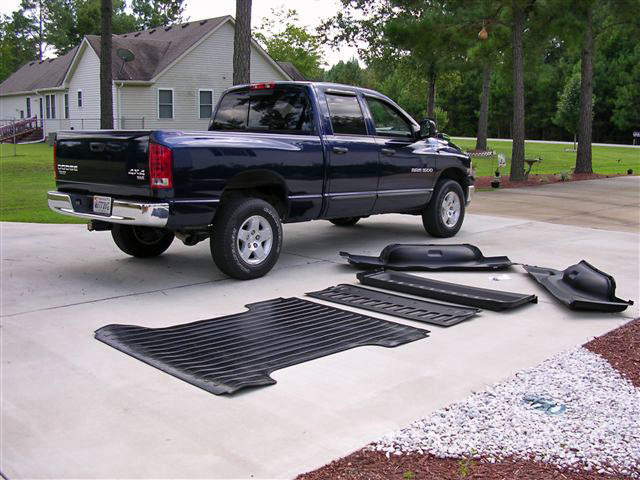 The makers of DualLiner sent one of their bed liner systems to us to install on a 2004 Dodge Ram pickup. The first thing we noticed was how it was packaged and delivered to the door. Everything you need is in one easy to handle box, and it was shipped right to the door. No making appointments or waiting in line required. 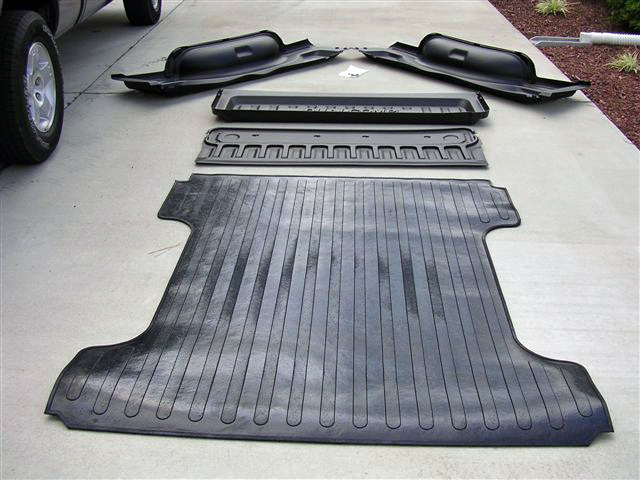 The kit consists of five parts... a front bed wall liner, two side wall liners, a tailgate liner, and a heavy duty, 3/8” thick rubber floor mat. Detailed installation instructions are provided with the kit, and the step-by-step process made it very simple. Total installation time is less than 30 minutes, and can be accomplished by just one person. The only tools required are a #40 and #27 Torx Driver; a ¼” drill bit, and drill. 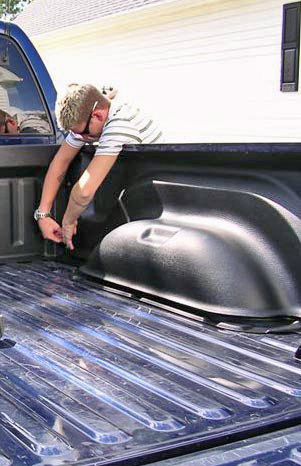 The first step is to remove the four cargo handles inside the Dodge Ram’s bed. We also swept out a few bits of debris to ensure no further damage could occur to the bed. The front bed liner went on first, and just slipped over the top front rail of the bed. Next were the two side pieces... make sure the upper edge of the liner is placed under the bed rails. The front and side pieces are secured together with four friction-fit tabs (commonly referred to as push-in automotive fasteners). We then re-installed the four cargo handles, which in turn fully secured the side panels. The fact that the top of the side panels tuck underneath the bed rails gave the installation a very clean look. The next step is to install the tailgate liner to the tailgate. Remove the factory Torx screws that hold down the access panel. Place the liner on the tailgate... the pre-drilled holes in the liner match up perfectly with the factory holes. Re-install the Torx screws to the tailgate. There are four additional pre-drilled holes in the liner, which are located towards the bottom of the tailgate. This is where you will need to drill four ¼” holes in the tailgate. The kit includes a tube of rust inhibitor... a small dab in each newly drilled hole will prevent rust. The four holes are then plugged with more push-in automotive fasteners. The final step in the installation is to lay the 3/8” thick rubber mat on the bed. There are grooves in the bottom of the side panels to which the mat fits in for a nice finished look. 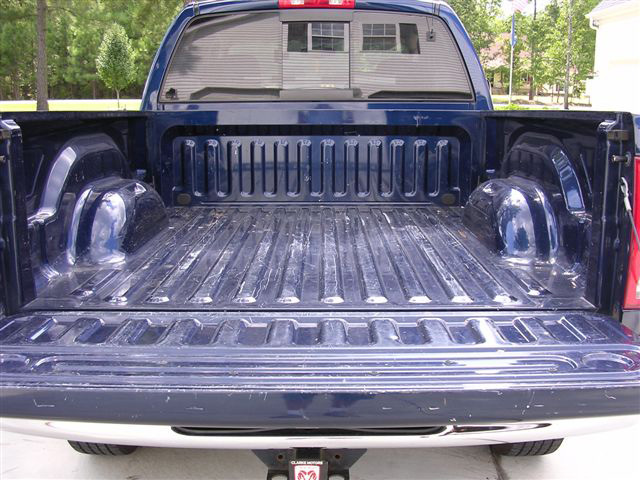 So here you go - a before & after shot of the truck bed... which one do you prefer? · Life time warranty - http://dualliner.com/objects/LifetimeLimitedWarranty.pdf. · The rubber mat ensures that absolutely nothing will slide around in the bed. · Will not fade or turn a “chalky” color. 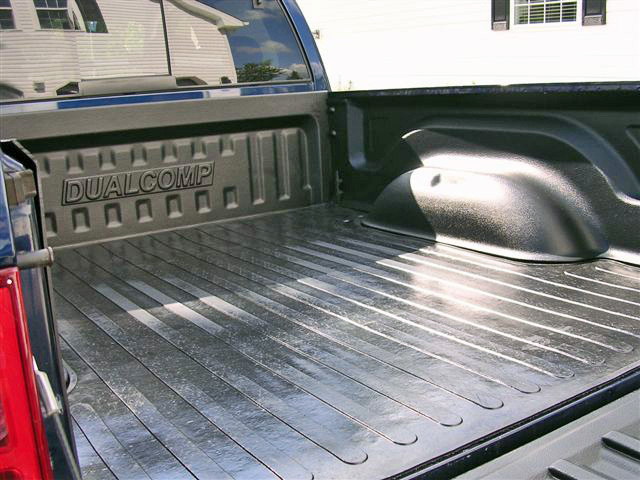 · Can be used with all types of Tonneau covers and/or bed rails.